I had my daughter, Monique, to put a rich copper brown permanent hair colour in my hair today, called Tints of Nature. Since I had not heard of this brand I was leery about trying it but must say I am impressed! The dye went on without making a big mess, something that always happens with other brands, and it coloured my hair completely. I have some gray. I did not end up with having to scrub hair dye off my face or neck either. 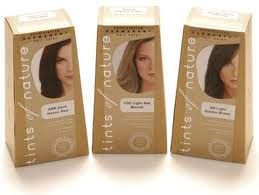 Tints of Nature did not burn my scalp as other brands have done, because I have sensitive skin. I would gladly recommend this hair coloring to anyone, as it delivered exactly what it said. An excellent product. *** Monique's note: this was an easy hair coloring to use, more than enough product in the bottle and I loved the color it turned mom's hair.